« My interview from the Wheaton All Night Flea Market. I have another event coming up this Saturday, November 8th! It will be held at “Old Toys Live On” hosted by owner Mike Thompson in Kenosha Wisconsin from 12-6pm. 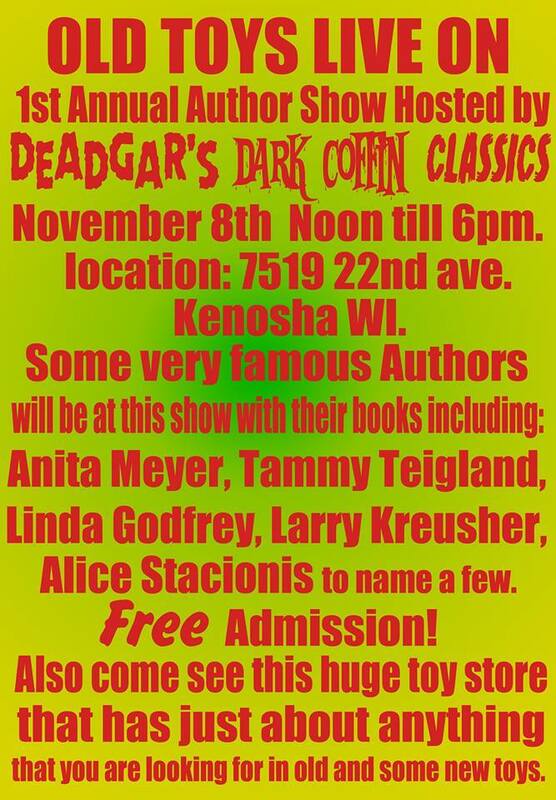 Additionally Authors Anita Meyer, Mary Sutherland, Linda Godfrey, Carol Schaufel, Alice Stacionis, Nano Munoz, and possibly other authors including TV host Deagar Winter and his Deadgirls from “Deadgar’s Dark Coffin Classics”! The newly relocated store is located at: . This is a awesome authentic place with old classic toys, collectibles, and memorabilia. Hope to see some of my fans there!